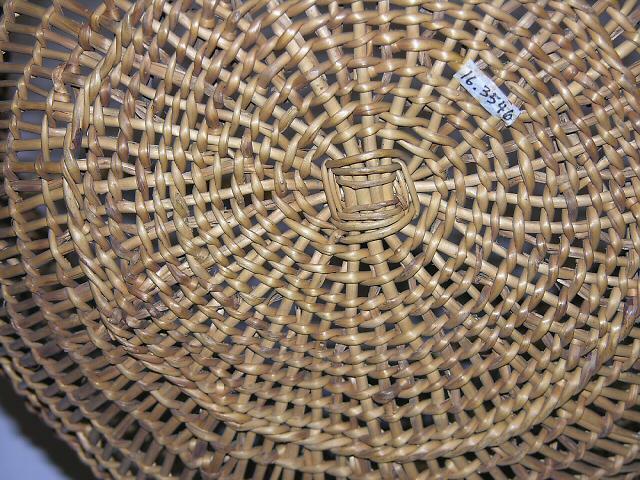 Basket, open work weave From the History Information Station: "Object: Basket made by open twining. It was collected among the lower Klamath River peoples, and dates to the late 19th or early 20th century. 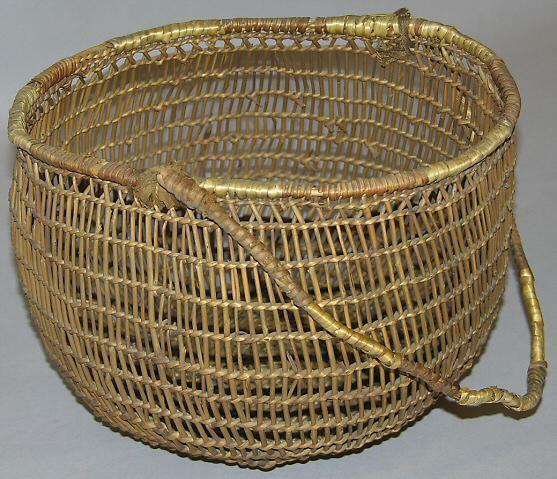 History: This basket is used for holding a man's carved antler spoons. From massive horns of the elk, a man carved elegant spoons for his own personal use. The only tool he used was a simple pointed obsidian tool called a graver. With his graver he picked away at the hard antler until a piece of suitable size could be broken off. He sandwiched the piece of horn between bunches of grass and placed it in a hole lined with hot rocks, which he filled with dirt. The resultant 'steam' treatment made it easier for the carver to bend the antler piece and shape it with his graver. Final shaping and sanding was done with an abrasive, rasping rock such as sandstone."